Since I've been following a low GL way of eating, I've been buying more oatcakes because of their low GL (glycemic load). This means they don't cause much of a rise in blood sugar levels. One of my favourite brands are Nairns who have a great range of oatcakes. This includes their Oaty Bakes and Oat Biscuits which I've reviewed already. 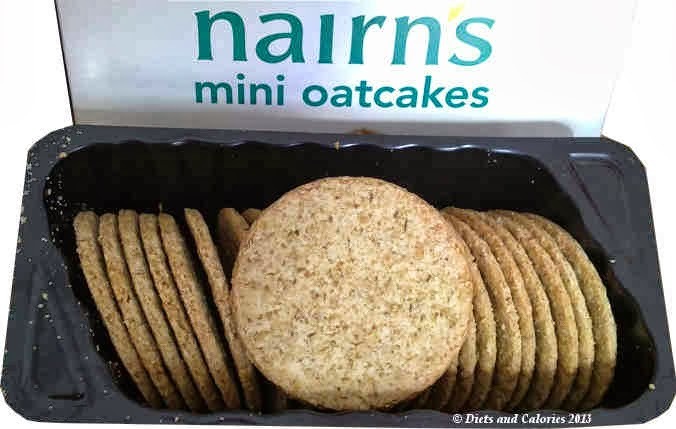 Nairns Mini Oatcakes are also great for calorie counters as each one has just 19 calories. 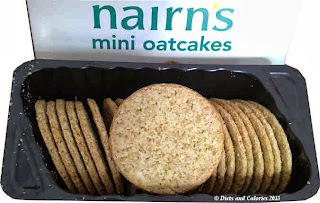 Nairns Mini Oatcakes are packed into a 200g box containing two individually wrapped trays with 24 mini oatcakes in each. They are small, measuring just 4.5cm (1.75”) across and about the thickness of a pound coin. They’re described as ‘Delicious bite sized oatcakes with a light texture and creamy taste, ideal for dipping or as a base for canapes’. The good thing about oatcakes is that they are more satisfying than a regular wheat crispbread or cracker. This is partly because they’re a lot chewier than most crispbreads, but also because of the oats they’re made with. Oats are a slower releasing carbohydrate so keep you fuller a bit longer. I love these oatcakes. In fact, I can happily eat them on their own in place of a regular biscuit. Like the description says, they are quite creamy, with a crumbly, chewable texture. My kids are enjoying them as well, both for lunch or as an after school snack. I spread them with a bit of peanut butter or some thinly sliced cheese, a fat slice of tomato and sprinkled with ground black pepper. They’re perfect with low fat cream cheese and cucumber for a satisfying snack at any time. While they’re low in sugar, they are high in fat, saturated fat and salt which is a real shame. This is mainly down to the palm fruit oil in the ingredients which, according to the box, does come from sustainable sources. But they’re also high in fibre and have no added sugar, no GM ingredients, no artificial colours, flavours or preservatives, no wheat and no hydrogenated fat. They’re suitable for vegetarians and vegans and are made with wholegrain oats. Ingredients: Wholegrain oats (84%), sustainable palm fruit oil, sea salt, raising agent: sodium bicarbonate. Contains gluten and cannot guarantee nut free. 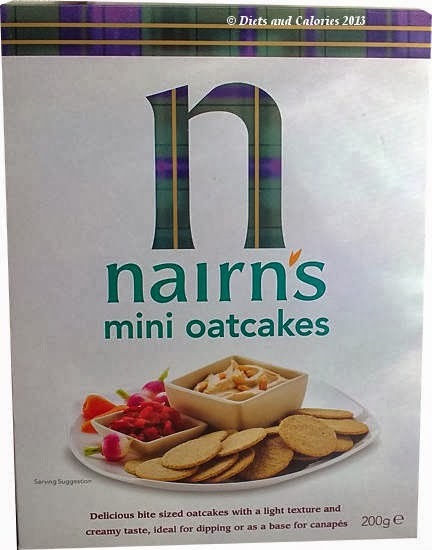 Nutrition Information per mini oatcake: 19 calories, 0.4g protein, 2.3g carbs, trace sugars, 0.9g fat, 0.3g saturates, 0.3g fibre, 0.07g salt. One mini oatcake has around 1GL. Available in health food stores and some larger supermarkets.